Status: Rare casual spring and fall visitor east and central. Documentation: Specimen: UNSM ZM15986, 13 May 1988 Omaha, Douglas Co.
13 May 1988 male found dead at Creighton University, Omaha (cited above) (Wilson 1989; Grenon 1990). Undocumented reports are of a “female” at Omaha 18 Feb 1945 (Haecker et al 1945, Haecker 1945), and a single bird visiting feeders in Omaha 4 Dec 1976 (Green 1977). Fall: There is a single record. 13-24 Nov 2017 female North Platte, Lincoln Co (Boni Edwards photo 13 Nov, above; eBird.org, accessed May 2018). 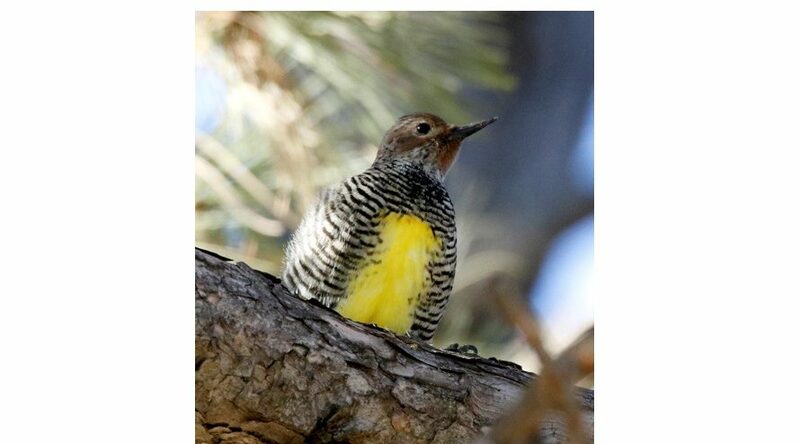 Comments: This species is a summer resident in lower elevation ponderosa pine forests in the eastern Rocky Mountains of Colorado and Wyoming, arriving in Apr and leaving in Oct (Andrews and Righter 1992, Faulkner 2010). The 11 easterly records in Colorado, Wyoming, South Dakota, and Kansas do not exhibit a clear pattern, although most can be attributed to straying spring and fall migrants. The lack of reports from the Nebraska Panhandle, which is close to the nearest breeding birds in southeastern Wyoming, is puzzling, but may be due to the lower number of observers there. Photograph (top) of a Williamson’s Sapsucker at North Platte, Lincoln Co 13 Nov 2017 by Boni Edwards. Green, R.C. 1977. Notes from nature. A Bird’s Eye View January 1977. Omaha Audubon Society, Omaha, Nebraska, USA. Haecker, F.W. 1945. N.O.U. Cooperative Bird Migration and Occurrence List for the First Half of 1945. NBR 13: 58-64. Jones, A.H. 1939. The Williamson’s Sapsucker at Hastings, Adams County. NBR 7: 27-28. Wilson, B.L. 1989. Williamson’s Sapsucker in Omaha. NBR 57: 30.